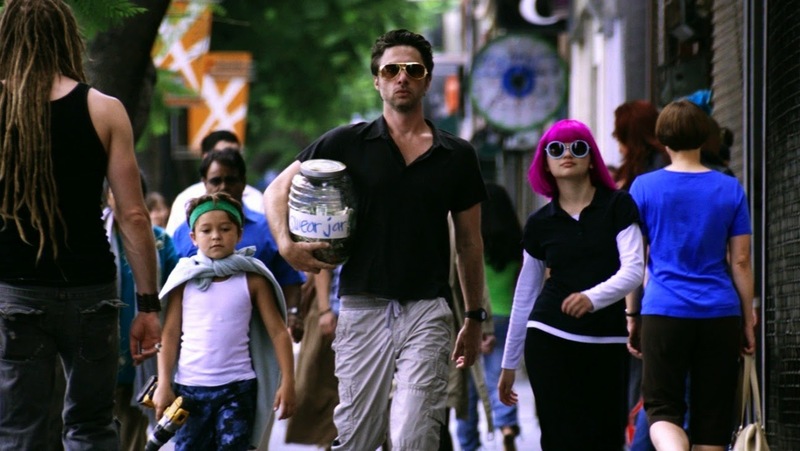 PLASTIC SOUL: a review of "Wish I Was Here"
In my family, 2014 has proven itself to be a sadly transformative year. In January, I said goodbye to my Grandmother, Mrs. Exzine Ryan, who passed away at the age of 93 after a slowly debilitating illness. Just two short weeks ago, I said goodbye to her husband, my Grandfather, Mr. Elihu George Ryan, who passed away at the age of 94 in his home and as a complete surprise to the family as he had not been ill whatsoever. My Grandparents, who had known each other since the earliest days of their respective childhoods and were married for 74 years, were the truest, kindest and most tenacious representatives of the family Patriarch and Matriarch that I could hope to think of and was completely blessed to have had. In both situations, I attended the funerals, where I briefly spoke at both events during the remarks sections of the ceremonies. I also was enlisted in both situations to be a pall bearer. And I was miserable. Regardless of the fact that I was more than willing to pay my respects to my Grandparents in that fashion, I hated every singe second of being a pall bearer. With the strains of The Beatles' "Carry That Weight" playing in my head over and over as I helped to carry each body across the cemetery field to the spaces where they would each be lowered into the ground for eternity, I internally hated every moment. I hated the act in which I was a participant. I hated the stark reality of what I was helping to carry. I hated being part of any sort of burial as both of them represented the best of what life is and they each respected every instance of the lengthy lives they were graced with. The entire experience, which also included being surrounded by family members all behaving and reacting in a fashion to which I have never seen despite the appropriateness considering the circumstances, was one that undoubtedly forced me to confront the very issues I try my very best to avoid thinking about...but are much more difficult to accomplish as I age. Of course, the reality of mortality is paramount. But in some ways, it was the reality of growing up that felt to be almost equally as painful. Yes, I am currently existing within the period of middle age where I have my own family, a home, a career teaching little ones and a host of adult responsibilities...and yet through it all, I still feel as if I am the same goofy kid that I have always been and still imagine myself to being. But again, having "adult responsibilities" and the act of "growing up" do not necessarily mean the same thing and after experiencing two funerals, which only signals the funerals to come, I found myself feeling as if fully growing up was imminent, and it just made me feel so sad. How does one care for an ailing parent and endure all of the additional responsibilities that accompany that care? How does one find a certain strength to build one's maturity, especially when you had never truly thought about those sorts of things so explicitly before? How does one find or even unearth inside of oneself the very characteristics that your ailing loved ones need from you the most? What is the balance one must find with maintaining one's own life and future as a dear loved one's life is ending? That, and the inevitable shifting of family roles, is growing up. Furthermore, those questions and more have been spiralling through my brain and in those cases, watching movies and writing stories about cherished youthful days feels frivolous to the point of being insignificant. I mention all of the above to you because this afternoon, I did return to the movie theater to screen Writer/Director/Actor Zach Braff's "Wish I Was Here," his spiritual sequel to his directorial debut "Garden State" (2004), and now famous for Braff's highly successful Kickstarter campaign, which helped to fund the film. "Wish I Was Here" is a story of arrested development building into adult maturity and responsibility in the face of death. Unfortunately, and despite the earnest and honest intentions that are clearly evident, the film, for me, is a failure. Please let me assure you that my reaction was not based within the feelings of not receiving what I hoped the film would give to me. It was stemmed in the fact that this was a film that had a tremendous amount of potential but unfortunately, Braff squandered it all in a misguided collection of prefabricated, canned and cliched characters and emotions that fully derailed its provocative core. For fans of "Garden State" and even Braff's work in Director Tony Goldwyn's romantic comedy/drama "The Last Kiss" (2004), the concepts and themes of "Wish I Was Here" feel like a most natural progression and you may find something to enjoy this time around. But for me, I was left seriously disappointed and deeply wanting. "Wish I Was Here" stars Zach Braff as Aidan Bloom, a struggling actor, loving husband to Sarah (a solid Kate Hudson) and overly preoccupied and inattentive Father to two children, Tucker (Pierce Gagnon) and teenager Grace (Joey King). When Aidan's Father, Saul (a wonderful Mandy Patinkin) informs him that he is rapidly dying of cancer and will no longer to be able to afford to keep paying for Tucker and Grace's private Hebrew school education, Aidan is forced to not only home school his children himself but to at long last, discover the full purpose of his life, a purpose that has been elusive for his 35 years. When "Garden State" was released 10 years ago, I have to admit that I was not fully taken with the film, although there was much to admire. It was evident that Zach Braff possessed a quizzical cinematic eye and proved himself to be a filmmaker who could establish a strong visual palate. With that quality, plus the film's primary themes and emotions of the restlessness and malaise that can be found during one's 20's, and of course, its long celebrated soundtrack, I felt that Braff made a touching "rainy day movie" that also worked as an homage to the films of Hal Ashby. However, I was not entirely sold as Braff also, and cloyingly, filed his film from top to bottom with the very self-congratulatory sense of quirkiness that litters so many independent films that "Garden State" felt to only exist inside of quotation marks and therefore, never contained emotions that felt tangible to me. With "Wish I Was Here," and as evidenced by the photo that I have placed at the top of this review, Braff's brand of the same self-congratulatory quirkiness is on display once again and it is still annoying to view. But even worse, is how Braff takes the inherent dramatic and comedic framework of his story and does not allow it, for so much of its running time, to just unfold naturally and without any sense of prefabricated forcefulness, making "Wish I Was Here" painfully saddled with a morass of poorly conceived and executed cliches. The children are cliched versions of movie precocious kids. Aidan's sloppy, vulgar, spaceman costume wearing, trailer living brother Noah (Josh Gad) is nothing more than a cliched version of the family black sheep. Sarah, who is also burdened with a needless subplot about office sexual harassment, is the cliche of the long suffering wife married to the "man-child." And as for that aforementioned "man-child," I was truly surprised that Zach Braff would write for himself and direct himself to be one of the most shamelessly cliched versions of arrested development and inept movie Dads that I have seen in quite some time. So much so, that once again, what Braff has conceived never feels authentic. Early sequences in "Wish I Was Here" depicted between Aidan and his children, Aidan with his Father or Aidan with the Hebrew school administration and Rabbis carried an almost low rent sitcom quality. The dialogue readings never felt to be natural, as if all of the actors were waiting for the laugh track to blare before reciting their next lines. Even Braff himself gave an often irritating performance that felt to illustrate not a man approaching middle age struggling with keeping his love of the arts and dreams of becoming an actor and balancing them with real life responsibilities, but more as a petulant, Borscht Belt comedian with an emotional range that dangerously bordered on infantile. There were moments when I wanted Sarah to just slap him silly and demand he step up to the plate, but if Braff allowed that, we couldn't then have the cliched male fantasy of the gorgeous wife who stands strongly beside her husband because she "believes in him," no matter how irresponsible he is and how absent he is in making their joined life together work for each of them. Those qualities severely damaged the strong core of the film's actual story and the pathos that Braff was obviously trying to mine, especially as "Wish I Was Here" also wants to explore aspects of the Jewish faith and overall issues of spirituality, most formally with the character of (the cliched named) Grace. But then, we could have funny costumes, wigs, sunglasses and cliched profane dialogue sections centered around the family "Swear Jar." Yes, all of those qualities could have worked in better cinematic hands, I suppose. Yet, despite Zach Braff's honest belief in this material, it just seemed as if he again did not trust himself. Just like in "Garden State," when that film's most emotionally naked and powerful sequence, one between Braff and his Father (portrayed by Ian Holm) was left as a deleted scene. As "Wish I Was Here" continues, it does gain some stronger footing. Throughout the entirety of the film Mandy Patinkin provides tremendous gravitas and skill with his depiction of a dying man coming to terms not solely with his mortality but with his strained and at times estranged relationship with his sons. He never strikes one false moment, no matter how often Braff lets him down. It also almost felt as if the film contained two different screenplays or at least, two extremely distinct and differing tones as many of the film's later scenes approached what I think Braff was trying to deliver. One sequence set in a hospital between Patinkin and Kate Hudson (who is happily rescued from inept "romantic comedy hell") is just beautifully written, directed and acted. Later sequences between Braff and Patinkin also show a profound growth and weight that seriously dialed down the nonsense and just allowed the film to breathe and resonate. But by those points, all I could do was just wonder openly why Zach Braff didn't make his film without all of the cutesy artifice in the first place. It's evident that he has something worthy to say and the desire to say it but by dressing up what never needed to be dressed up, "Wish I Was Here" became an emotionally false experience that I think some (myself included) could argue knows nothing about growing up, parenting, being an adult child to an aging parent, love and marriage, spiritual/religious searching, reconciling one's youthful dreams of individuality and integrity while adhering to adult realities, as well as death and dying. But, the best of this material is just so hampered and hindered to such a detrimental degree, which is just such a shame and "Wish I Was Here" could have truly spoken to the soul. Look dear readers, I have nothing against Zach Braff and I have no issues with his specialized brand of emotion and sensitivity, as he is so often mocked on the internet. In fact, I admire his tenacity with wanting to get his new film made, his way. Perhaps his cinematic aesthetic is one that does not appeal to my sensibilities, and that is something I will concede. But, even so, the tonal mess of "Wish I Was Here" frustrated me greatly, making this film one of 2014's big disappointments. WHEN HUMANITY DIES: a review of "Dawn Of The Planet Of The Apes"
Now, while I enjoyed them, I was still not entirely taken with the films. However, I was absolutely fascinated by not only their level of extreme violence for films that were surprisingly rated G but also their relentless sense of bleak nihilism. I mean--the second film in the series, Director Ted Post's "Beneath The Planet Of The Apes" (1970) concluded with the complete nuclear destruction of Earth and a dark voice over intoning the following statement: "In one of the countless billions of galaxies in the universe, lies a medium sized star and one of its satellites, a green insignificant planet is now dead." Now that's entertainment! What I suppose fascinated me the most from those five films was their collective sense of allegory, which felt blindingly obvious to me in the late 1990's, yet I wondered how audiences felt when the films were originally released. All of the social/political issues of the day are all there in the original series, including, but not limited to, the environment, the ecology, the futility of war and subjugation of others, genocide and so on. The series' fourth film, Director J. Lee Thompson's "Conquest Of The Planet Of The Apes" (1972) was of intensely special interest to me as that film detailed Caeser's (memorably portrayed by Roddy McDowell) emancipation and his leadership during the eventual ape uprising, something that obviously was designed to be an allegory to the Civil Rights/Black Power movement. One white male character, frothing at the mouth at the sight of apes brandishing artillery, practically screeches, "They're ARMED!!!!" To which, his appropriately African-American compatriot, sagely responds, "And they're organized." Additionally, and as outstanding as Serkis is, he is superbly aided by all of the other actors within the film; from the ones who also portray the apes (most notably Toby Kebbell as Koba, who brings a malevolent Shakespearian heft to his scenes with Serkis), as well as the actors who portray the human characters and have to make us in the audience believe that what we are seeing is undoubtedly happening. These are all performances worthy of awards season recognition and if Andy Serkis is not recognized in some appropriately conceivable way, then there just may need to be an uprising against the Academy! TWICE: a review of "Begin Again"
John Carney, you have miraculously done it again! In a perfect movie going world, "Begin Again," the new film from Writer/Director John Carney, who gave us the critically acclaimed, award winning and box office smash independent musical drama "Once" (2007), would be sitting proudly at the very tip-top of the box office. However, we unfortunately live in a "Transformers" world,a world where banging, booming, and ultimately soulless product has no room for anything approaching artistry or even any sense of honesty...and it is currently the highest grossing film of 2014. Ugh! That being said, there is no reason that "Begin Again" is doomed to fall through the cracks, especially as I feel that strong word of mouth will assist this lovely, charming, and wholly untainted musical comedy/drama/romance story greatly. Several times this year, I have seen strong to absolutely terrific films that I feared would fall by the wayside, most notably Director Ritesh Batra's excellent culinary romantic drama "The Lunchbox" and Director Jon Favreau's mouth watering and vibrantly entertaining "Chef." But both have connected most affectionately with audiences and I strongly feel that "Begin Again" fits very comfortably alongside those features. As of this time, I am here to give "Begin Again" the push it needs to get you to the theater and see it for yourselves as I think that you will find yourselves not only enormously entertained, emotionally disarmed but also deeply affected by its quiet and unassuming poignancy. "Begin Again" stars a fast talking, terrifically shaggy Mark Ruffalo as Dan Mulligan, a once Grammy award winning producer/record label co-owner but now recently fired record label executive who is also nursing the emotional wounds from his estrangement from his wife Miriam (Catherine Keener) and his teenage daughter and budding guitarist Violet (Hailee Steinfeld). Keira Knightley co-stars as Gretta, a songwriter who has recently broken up with her writing partner and rapidly rising star Dave Kohl (Adam Levine). Both crestfallen individuals meet inside of a New York East Village bar as Gretta nervously and reluctantly performs one of her compositions to an indifferent audience, however, the depressed and drunk Dan instantly connects with the music, inspiring him to make the impossible pitch of representing Gretta and serving as her music producer. Refusing to relinquish any sense of her artistic integrity, Gretta and Dan soon arrive upon the idea of possibly recording an album in and around New York city, guerrilla style, live, with no overdubs, and whatever is captured on tape is captured, therefore always becoming a part of the musical experience. Essentially, that is the structural element of "Begin Again," a scarcity of plot that leaves ample space for the thematic qualities of the intense power of creativity and art, the joys of communication and community, as well as the sweet enrapturing spell of personal redemption to fully envelop the characters, the situations, the terrific songs and for all of us within the audience. It is the perfect companion piece to Carney's "Once," a film that succeeded so wondrously almost by sheer force of will and through the undeniably purity of its intentions. If you think back to that particular film, "Once" was a movie that possessed quite possibly the most bare boned plot and characterization that I can think of in fairly recent memory. That film's main characters didn't even have names as they were known only as "Guy" and Girl." And yet, that film soared so beautifully and confidently as the entire proceedings were so open hearted, so unfiltered, and without even one iota of irony and cynicism that "Once" was tremendously irresistible. Even with more detailed and complex stories and back stories for the characters (as well as giving them names this time around), "Begin Again" operates on that exact same conceptual and emotional playing field as Carney refuses to clutter his movie with anything superfluous and to just allow the characters, their behaviors, their struggles, wishes, hopes, fears and interpersonal connections and yes, their music, to speak for themselves without hyperbole, and prefabricated drama. Now, there has been quite a fair amount of criticism that I have seen aimed towards this film for depicting a New York city that is remarkably accommodating for Dan and Gretta's musical pursuits, that what we are seeing is a fantasy of New York and not a reality of New York. To that, I say emphatically that those criticism say more about those writers than about the film itself, especially for a film of this nature, one that proudly and unapologetically wears its hugely open heat on its sleeve and like "Once" has the purest of intentions. You can easily see and most importantly, feel that John Carney means every single frame of his movie and to that, his artistic integrity should be commended and celebrated. What John Carney has devised is a story, characters and film that always feels emotionally true and he has served his project well by aligning himself with a team of actors and musical collaborators who all elicit an equally pure sense of commitment to making this film sing as best as it is able. I have long felt that Mark Ruffalo is one of our most charismatic and engaging actors and with "Begin Again," he continues his streak as simply being magnetic to watch. With a physical appearance that strongly suggests Wayne Coyne of The Flaming Lips, Ruffalo carries a wheeling dealing zip and vigor as the former record exec Dan Mulligan as we can see exactly how he could have been a figure to amass a certain level of fame and fortune as well as how he could have ended up in a position where he had not signed even one artist in seven years. While brash, arrogant, occasionally crude and vulgar, Ruffalo always presents us with the necessary and significant layers that make Dan a character that is compelling to follow. We can easily appreciate his ferocious creativity and inventiveness, and Ruffalo never allows himself or the audience to lose sight of his specific pathos. For Dan Mulligan, "Begin Again" represents the period of his life when he is literally and figuratively crawling upwards from the bottom and Mark Ruffalo ensures that we remain riveted to his each and every step upwards, especially as it has taken only hearing a song to fully inspire his ascent. Keira Knightley is absolutely beguiling! Aside from her work in Writer/Director Lorene Scafaria's undervalued, underseen yet stirring and fearless apocalyptic romantic comedy "Seeking A friend For The End Of The World" (2012), I do not think that I have ever seen Knightley in such a naturalistic performance. Like Robert Downey Jr. often achieves, Knightley essentially floats through this film with seemingly effortless ease, making all of her dialogue sound as if those are the words she just happened to speak extemporaneously each day that she arrived on the set. Her warmth is richly enveloping, just as her humor and sparkling charm. Yet, Gretta is no smiling moppet with a guitar. For the character of Gretta, we also find her at a personal crossroads but also a figure with an unshakable integrity when it comes to her art, ho wit should be recorded, presented and performed. She is nobody's fool although her heart may mislead her from time to time, a quality which makes her so recognizably human as the parameters we may impose upon our work, hobbies or art may be more elusive when dealing in inter-personal relationships, the very situations that are impossible to control. Yet, most importantly of all, Keira Knightley and Carney ensure that Gretta is never a character whose outcome, and overall identity, is defined by who she is romantically attached to, truly refreshing for a quality that still sadly plagues the arc of female characters in the movies. John Carney's "Begin Again" illustrates the process in which two souls not only connect but also reach towards each other inspire each other, build trust together and therefore, heal themselves as individuals and with Mark Ruffalo and Keira Knightley at the helm, you will be fully swayed by their infectious and golden chemistry. They are impressively supported by the entirety of the film's cast, especially Yaslin Bey (the former Mos Def) as Dan's former business partner and even moreso, Adam Levine, who is a most clever casting choice as it seems as if he is either making a parody of his own pop star persona as leader of Maroon 5 and judge on television's "The Voice" or perhaps, this role is a way of keeping himself artistically in check. And then, there is the music of the film, which indeed serves as a crucial character within "Begin Again," just as with "Once." Now as much as I thoroughly enjoyed "Once," I would indeed give this new film the edge musically as the folk songs of "Once" did tend to have a certain sonic sameness. With "Begin Again" by contrast, all of the songs were written or co-written by Gregg Alexander, who once led the short lived band New Radicals and did compose the nearly perfect 1998 power pop song "You Get What You Give." It must also be noted that Keira Knightley performs all of her own singing in the film, giving "Begin Again" an even greater authenticity. But aside from the folk/power pop sonics of the music, which are all terrifically performed and sung, the magic lies within how John Carney represents the characters', and therefore our, relationship with music. Take the sequence early in the film when Dan first hears Gretta shyly singing her song. As he looks at her, responding to her voice, the lyrics and the melody, he begins to imagine a full band arrangement, which is visualized by the drums, electric guitars, cellos and bass guitars all invisibly playing themselves around Gretta on stage. Then, there is another wonderful sequence that features Dan and Gretta simply strolling around New York city at night, sharing headphones and an MP3 player shuffling through songs, all the while gathering a connection between the music, the environment around them as well as with each other. And there are all of the musical performances/recording session sequences themselves, which all present the connection that occurs when musicians collaborate to make a perfect song and the effect is often joyous. I especially loved the absolutely glowing sequence in which Dan's daughter Violet joins in on electric guitar while Dan plays bass, a moment that begins to re-establish and revitalize their Father/daughter bond. John Carney's "Begin Again" is a lovely, wistful, hopeful and sensitively presented film. It is an experience that not only presents human beings with intelligence, heart and truth, it is also a film with no villains as all of the characters are just trying to life their lives in the way they see fit. While some may exhibit bad behavior or make choices that inflict pain upon another, no one is malicious or out intending to cause harm, which also makes "Begin Again" work very well as a film about choices, consequences and how we live with ourselves and each other. It is a film that works as a celebration to music, authenticity, integrity, compassion, and a renewal of spirit and a purity of soul. And while it may be a bit too much of "pie in the sky" romanticism for some, I really believe that "Begin Again" does indeed have some palpable grit in its material, making the uplift feel emotionally true. For what else is "Begin Again" about but the brave act of asking for help and being equally brave to accept it? Dear readers, leave your cynicism in the movie theater parking lot as there is no room for anything of the sort with "Begin Again." This is a film with many songs in its wide, open heart and perhaps, you will be singing along with it throughout and quite possibly, long after the end credits roll. Let's keep this hot streak going!!!! With all of my terrific adventures going to the moves this year, I am hoping that the month of July continues the amount of greatness that I have been so fortunate to see. In particular, there are two films that will possibly arrive in my city this month, which have already garnered a large amount of acclaim on the film festival circuit, films that I have been just itching to see all year long. 1. At the very top of my personal list of want-to-see films is none other than "Life Itself," Director Steve James' celebrated documentary about the late, great film critic/writer Roger Ebert. 2. Anticipated possibly just as highly is Writer/Director Richard Linklater's "Boyhood," his three hour epic, which was filmed a few days at a time over a twelve year period. 3. I am also very curious about "Begin Again," the new musically influenced from from Writer/Director John Carney, who gave us the lovely "Once" (2007). 4. 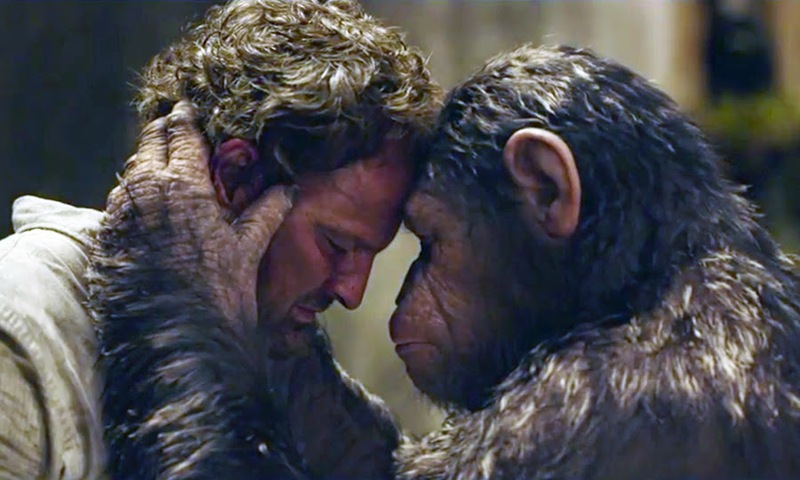 The impressively dark trailers for "Dawn Of The Planet Of The Apes" have made me very anxious to see this film as well. 5. And yes, Writer/Director Woody Allen reveals his annual feature with "Magic In The Moonlight," and as always, I'm there! 6. Alongside those features, let's see if I can keep up with some of the films that I didn't see in the theaters during the earlier portion of the year, including Actor/Director Jason Bateman's spelling bee dark comedy "Bad Words." That's more than enough to keep me busy and so I ask for you to keep your fingers crossed and wish me well.